Sue and I flew out of the Manchester, NH airport Tuesday morning 03/19/19 for a visit to Maryland to see my brother Alan. 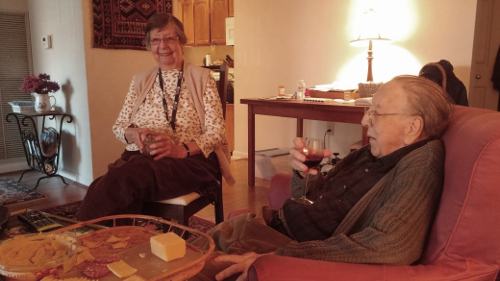 His son Dean picked us up at BWI and drove us up to Parkville where Alan and Abbie live in the Erickson retirement community, Oak Crest. 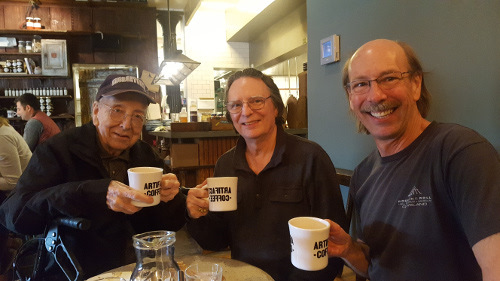 Sue captured this great shot of Alan, me, and Dean at Artifact Coffee in Baltimore on Wednesday. We had rented a room in the community so that we could be close to them. After checking in, we relaxed there for awhile as Alan was taking his afternoon nap. Around 3:45 pm Sue and I walked over to one of the wooded pond areas on campus that we love, and then strolled back to their apartment. We arrived just before 4:00 pm as that's when the flag goes up. My brother says that when you're retired, the flag can go up at 4:00 as opposed to working folks who have to wait until 5:00. Fine with us! There was a selection of wine to choose from, and Abbie had put together a nice tray of cheese and crackers for everyone. We had a wonderful visit for a couple of hours. Dean had suggested that he would drive Sue and I over to a restaurant for dinner as he thought his dad would not be up for it. And though, he did appear to be tired, at the first mention of going out to dinner, Alan was pulling himself up out of the chair ready to go. So, off we all went to a local Bertucci's Brick Oven Pizza & Pasta as we had Italian food on the brain all day in anticipation. Of course, we had to have a glass of wine to celebrate our good fortunes at being together, and the food was terrific. We had thought that when we got back, we'd watch Alan's number two favorite movie: the 1987 Moonstruck with Cher, which if you haven't seen it, is such a lovely film. His favorite movie is the 1939 Prisoner of Zenda with Douglas Fairbanks Jr., and his number three favorite is the Francis Ford Coppola classic 1972 movie, The Godfather. It had been a zillion years since either Sue or I had seen Moonstruck, and I was really looking forward to watching it with Alan. One of my favorite scenes is around the dinner table where the mother, Rose Castorini, played by Olympia Dukakis, cautions her father-in-law: "Old man, if you give those dogs another piece of my food, I'm gonna kick you 'til you're dead!" You just gotta love it! Unfortunately, by the time we got home, Alan was getting really tired. So, instead of a movie, we just sipped another glass of wine and chatted until we could see he was about to nod off. Sue and I went back to our room and watched The Weather Channel for awhile - the horrible destruction throughout Nebraska with flooding that impacted 90% of the state's population; we just couldn't believe it. But we were pretty tired as well, and so called it a night around 9:30 pm. We were both really tired from the trip, and just the overall stress of the situation, and slept through until about 7:00 am Wednesday morning. We walked through the hallways, following the signs to the other side of the complex to a nice cafe, Banners, for breakfast. Bacon, eggs, some hash, and the obligatory coffee, and we were all set for the day. After finishing, we took our coffee and walked over to the main lobby area the building we were staying in. We sat across from a massive gas fireplace that was on, and just relaxed. We didn't head over to Alan's until 10:45 am because the nurse comes every morning to help him. But we wanted to get there as close to 10:40 as we could so that I could get on-line to print our boarding passes. For Southwest, you can check in 24 hours prior to your flight tim. Coming out I hadn't been able to do that soon enough, and we had ended up at the back of the C boarding line. Flights were obviously busy because even though I had the passes by 11:00, we were still B46 and B47; another packed flight. 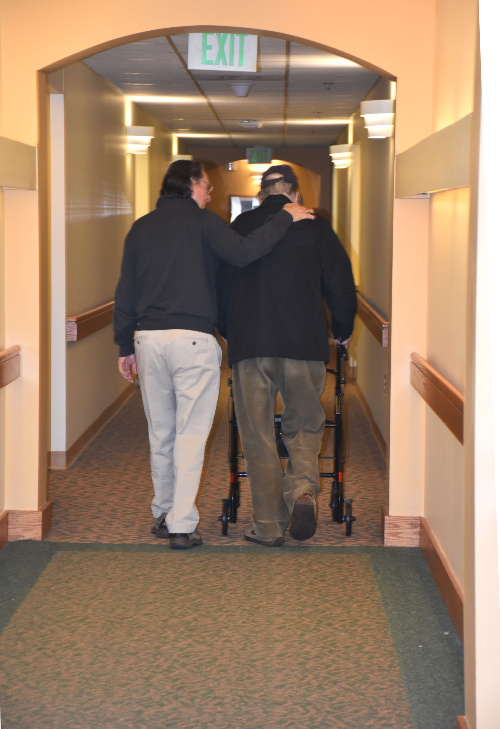 As soon as I had the passes printed, I helped Alan down the hall with his walker while Dean got the car. We were headed to Alan's favorite lunch spot, Artifact Coffee in Baltimore. Sue and I had been there with him before during our last visit to see him 10/17/18, and were excited to be able to share that with him again. He had such a great time that he lounged over 2 cups of specialty coffee: first, a Peruvian and then a Columbian. I tasted both, and actually liked them better than the Guatemalan that I had, though it did pair really well with the great bowl of black bean soup and corn bread that I had for lunch. Alan was pretty beat by the time we got back to their apartment, and went into the bedroom to lie down to rest. 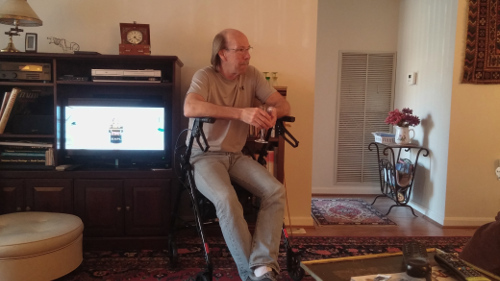 But he said he was fine to chat while Sue and Dean headed out to the liquor store to restock the wine supplies, and Abbie took off to run some errands. 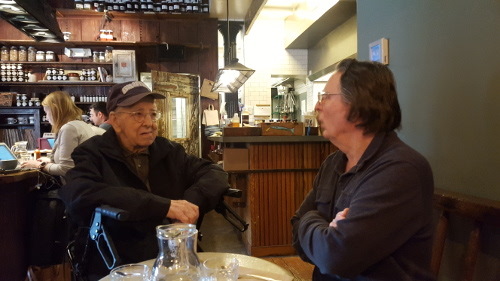 That gave Alan and me an hour or so to just have some wonderful time together before they all returned. Sue and Dean got back a little after 3:00 pm, and we all enjoyed just hanging out. But the natives were getting restless as the clock crept toward the 4:00 pm time when the flag was supposed to go up. Abbie called to say she was on the way home, but would be awhile getting there. Well, 4:00 pm is 4:00 pm around there, and the flag had to go up regardless. When she finally did arrive, Sue helped her cut up some sausage and cheese with crackers for us all to snack on. The idea was to have a little party, and get started watching Moonstruck until it was time for Dean to head out to get take out pizza. But no matter how hard everyone searched the apartment, we couldn't find their copy of Moonstruck anywhere. And no where could we locate it on-line, either! By the time Dean got back with the pizza, we had decided to watch The Godfather. Again, it had been years, and years since either Sue or I had watched that, and it was just great. But Alan was so exhausted from the day that he had to go into the bedroom to rest. We all continued to watch the movie, but around 8:30 pm we knew it would soon be time for us to leave. Dean went in and got Alan who seemed to have benefited from the short rest, and was eager to come back out and join us. We all had a wonderful time just being together. It was so hard to leave, though. This would be the last we'd see Alan this visit as Dean was driving us to the airport at 7:30 am the next morning, Thursday, to get down to BWI for our flight home. It was a very long, and sad walk that I had with Sue as we headed slowly back to our room. However, as we came up the walkway on the outside of their apartment, Sue and I barked at the full moon for him as we passed their windows; the tv was probably up too loud for him to hear it, but we did it. Well, we didn't care because we were going home, but I told him not to be surprised if security came knocking on the door to inquire who the animals were that serenaded him on the first night of Spring! 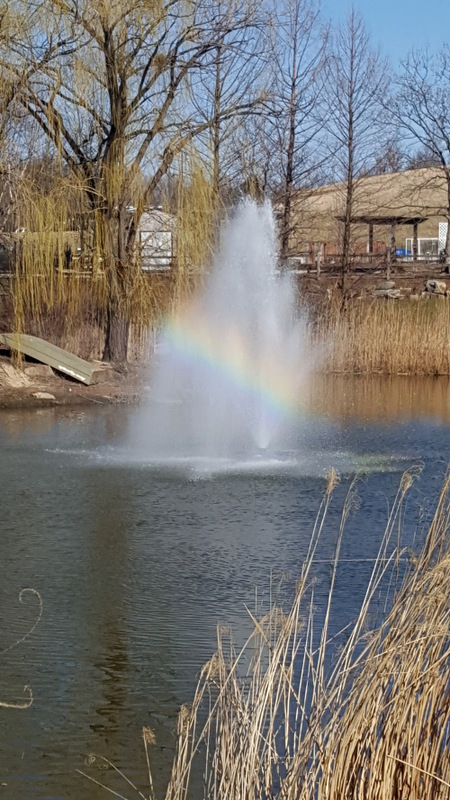 Rainbow of joy Tuesday at the Oak Crest community pond. Dean acknowledging that the flag is up Tuesday! The clock shopws it's 4:20. 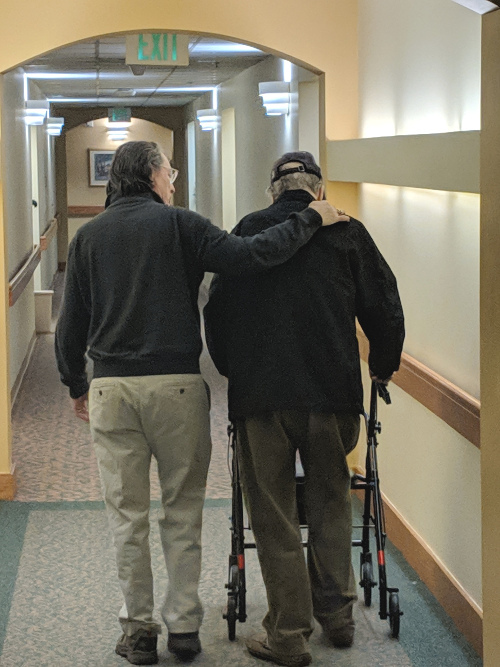 Dean got this shot of Alan and me walking down the hall to drive to lunch at Artifact Coffee in Baltimore on Wednesday. Another picture taken by Sue. Alan and me at Artifact Coffee in Baltimore on Wednesday.